Why are the two voltage values sometimes used simultaneously, as having both creates some confusion when dealing with aircraft electrical systems? What follows is a simplified explanation that, with some exceptions, is applicable to most aircraft. Almost all aircraft produced today have a 24-volt electrical system. The advantage of a 24-volt power supply versus the 12-volt of older aircraft is weight saving and decreased cost due to the requirements of a smaller wire size. Thus the aircraft battery now is a 24-volt unit comprised of twelve 2-volt cells. To be a little more exact, each 2-volt cell actually reads about 2.125 +volts with no load or 25.5 volts for the complete 24-volt battery. To charge a 24-volt battery, one must apply a higher voltage to force electrical energy into the battery. This is accomplished with the ships’ alternator/generator working through the voltage regulator to produce 28.5 volts + or -. Thus when the alternator/generator is in operation the aircraft’s electrical system is operating at a voltage higher than 24 volts. In this situation the electrical system is maintained above 24 volts even under normal load. As one applies a load to the battery, the voltage will drop as the load is increased. For turbine starting purposes we would like to keep this drop to a minimum. Most starter motors or motor/generators on turbine engines are rated to accept 30 volts without damage. At the time of first activating the starter, the highest amperage draw is experienced. The amperage can be over 1000 amps on some gas turbine start up engines. As the start progresses, the amperage requirement becomes less throughout the start cycle. Due to the high loads involved in a start, a battery must be in good condition to minimize voltage drop. Of course at lower voltage levels the battery will put out less amperage. Some starter motors will pull a good battery down to 15 volts during the first phase of the start. Now most engine manufacturers (turbine) recommend a 28.5-volt start if available to minimize voltage drop. This is normally accomplished with some sort of external ground power unit (GPU). In this scenario it is most advantageous for the turbine engine that 20 percent or more energy is being delivered to the starter motor, resulting in a faster, cooler start thus increasing turbine life. Also from a maintenance standpoint, using 28.5 volts, various aircraft electrical components under load can be checked out above 24 volts. In conclusion, one should always opt for a 28.5-volt start if available. Start Pac® offers two true 28.5-volt battery packs utilizing 14 cells. See the following graph comparing the 28.5-volt Start Pacs® verses 24-Volt Start Pacs®. As one can see, higher voltage is available throughout the start cycle on the 28.5-Volt models. All batteries suffer from cold temperature. Aircraft batteries will not supply enough energy to start a turbine engine when exposed to very cold temperatures. Cold temperatures have less affect on the high tech lead acid batteries used in Start Pac® than most aircraft batteries. Even these high tech batteries will lose performance in colder temperatures. Battery life is cycle dependent in most cases. The more the plates in the battery are stressed or cycled the faster they wear out. Worst case scenario is cycled from fully charged to nearly depleted. In this usage, around 400 cycles can be expected. If only a small percentage of the capacity is used at a time up to 1200 cycles can be expected. It is most important to recharge the battery as soon as possible after use to prevent sulfation. This condition will greatly reduce capacity and output of the Start Pac®. Also avoid completely depleting a battery as sometimes it will go into a state of reversal and will be damaged beyond repair. 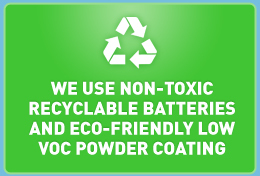 If properly maintained and operated, Start Pac® batteries will last for years before replacement is required. One would think two batteries of the same voltage but different capacity would have equal voltage drop under the same load. Not always true. The battery with the larger capacity will have less voltage drop due to having a larger plate surface area. Since the load is essentially spread out over a larger area, the battery chemistry is less affected. 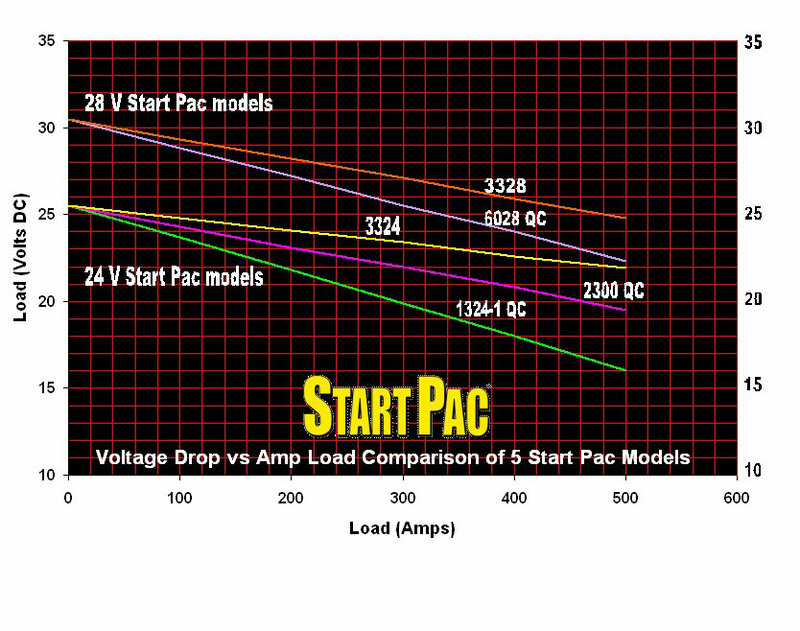 See the following graph comparing all 24 volt Start Pac® Models. If a user requires many repeated starts between charges, always choose the unit with the higher capacity. The voltmeter is an essential tool to aid the pilot when starting turbine engines. Any battery or GPU will have a normal voltage drop when initiating a start. If the pilot sees an abnormal voltage drop, they will abort the start so as to avoid a “hot” start. This example illustrates that a voltmeter can be used to determine battery condition and a low state of charge only when the battery is put under load. If not under load even a depleted battery will read almost full normal voltage. This is why Start Pac® does not use a built in voltmeter, as it really is not an indication of the state of charge and also adds to the cost. There are some electronic indicators that can measure the state of charge but are very expensive. The voltmeter belongs in the cockpit, not on the GPU.